Here's our full guide to the Arena portion of Monster Hunter World. The Monster Hunter World Arena gives you all the action of fighting a monster, but without having to hunt it around an entire map like you normally would. In this Monster Hunter World Arena guide, we'll be walking you through firstly how to unlock the Arena in MHW, and then how to take full advantage of the battleground to earn as many unique rewards as possible. If you instead need anything else on the massive game of Monster Hunter World, including how to use the Scout Flies to rapidly hunt a monster, as well as how to get the best equipment and items for your Palico, head over to our Monster Hunter World guides walkthrough hub. Situated in the very top floor of the main MHW hub area, you can find the Gathering Hub, wherein you can find an Arena vendor at a stall offering you certain challenges. Approach this vendor, and they’ll tell you all about the Arena, where you can take on monsters that you’ve previously defeated in quests/expeditions, in a straight fight to the death. The gear you take into each Arena Quest is where things get slightly more complicated. For each Arena Quest, you can select one of five weapons to take in with you, and on top of that, each weapon comes with its own armor set. 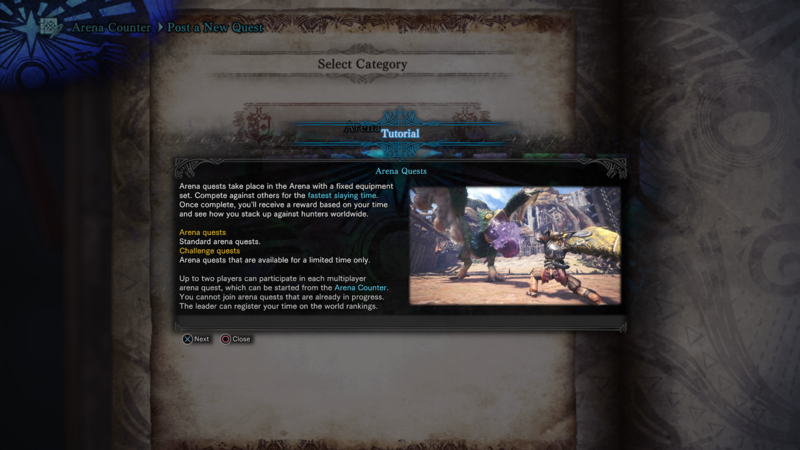 For example in the Arena Quest with the Pukei-Pukei, your gear choices include a Jagras Blade 1 with Rathalos armor, a Luma Knife 1 with Luma armor, an Iron Hammer 3 with Diablos armor, a Jagras Axe 1 with Tzitzi armor, and a Thunder Blitz 1 with Pukei armor. On top of this, each gear loadout for every Arena Quest comes with predetermined inventory items, although these are few variations of inventory items between each weapon/armor loadout option. You’re always guaranteed Potions, Mega Potions, a Max Potion, and Well-Done Steak as standard, which should always be enough to see you through to the other side of the Arena Mission safely. You’re obviously going into the MHW Arena with rewards in mind, so what are they? You’ll gain a certain amount of money as standard for each Arena Quest that you successfully complete before the timer of 50 minutes expires, but you’re also battling it out for the glory of a high Rank and time against each monster. Just below, you can find a complete list of all the Arena Quests we’ve uncovered so far, along with their corresponding monster, as well as their tiered time-related Ranks. 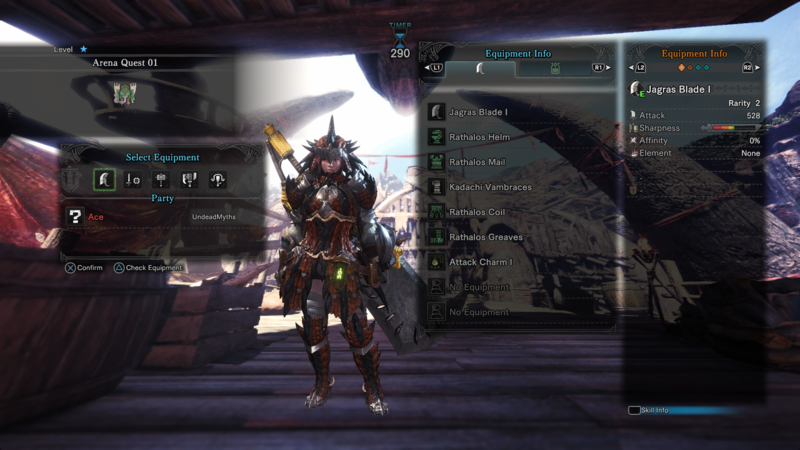 To obtain the fastest time possible in the MHW Arena, you should pick a weapon that you’re familiar with. If you’re familiar with a heavy weapon like the Switch Axe, and how to pull off devastating combos with the weapon, then you should choose this over all else, as you have precious few items given to you to use outside of your main weapon. We’d generally recommend staying away from ranged weapons in the Arena, as you’ll want to be laying into the opposing monster as quickly as possible as soon as you get into the Arena. After you’ve defeated a monster in an Arena Quest, you’ll have a quick 20 seconds to examine their corpse for a monster-related item, before you’re returned to the Gathering Hub area. You’ll note that you now have a time recorded for the Arena Quest that you completed, and you’ll also have a best time tied to each equipment loadout for each quest, meaning you’ll have plenty of work to do if you want to obtain a Rank A across the board. 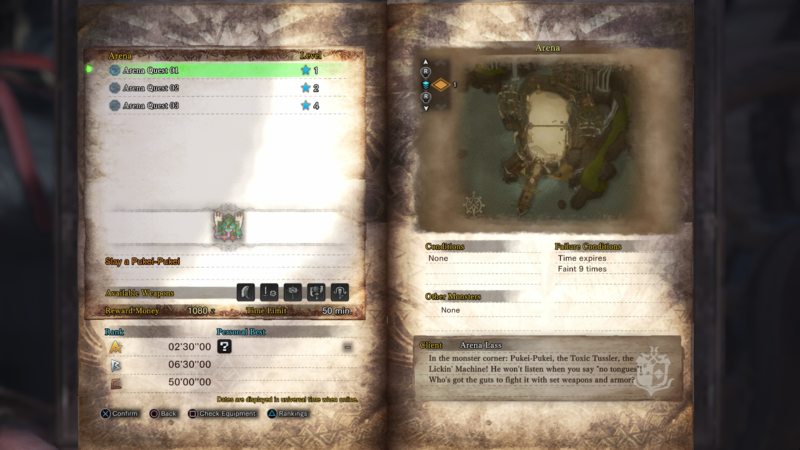 This brings to a close our Monster Hunter World Arena guide, but we’ve got plenty of additional guides covering various other complex topics for the game, including a guide on how to cook food and use the Canteen, as well as our guide on how to capture a monster alive.